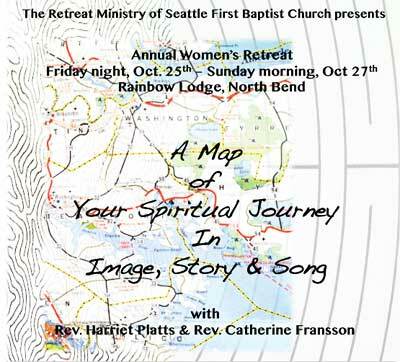 I’m thrilled to be facilitating the retreat, A Map of Your Spiritual Journey in Image, Story, and Song, for the women of Seattle First Baptist as well as for other women seekers interested in reflecting on women’s spiritual development, who’s responsible for it, and to explore the language/metaphors that represent our journey over time! The subject area of spiritual development is of great interest to me, and it is a privilege to be collaborating with Rev. Catherine Fransson, Pastor of Spiritual Formation at Seattle First, in this retreat experience. I believe that the actual words/metaphors we use to conceptualize our spiritual journey, reflect the ways in which we make sense of our experience, and can even effect the arc of the journey itself. In addition to lecture, discussion, and small groups, we’ll be creating group maps and personal maps as we explore ways to name parts of our spiritual journeys. As we learn and listen together about women’s spiritual development, share curiosity about ownership of the journey as well as explore our growing edges, I trust we will gather new insights, clarity, and renewal to continue to live and grow toward greater fullness and freedom! You do not have to be directly connected to a faith community of any kind to participate. All earnest women seekers are welcome! You might think about sharing this experience with a friend! For more retreat details or to register, please download this pdf: 2013 Woman’s Retreat. Categories: Everything else and Workshops & Retreats. Tags: events, pastoral care, Rest, and workshops. Join us for this half-day, spring retreat where through movement, storytelling, singing, connecting with others, and just being, we’ll inquire into what we KNOW as embodied creatures about making promises. You may download and print the flier here. 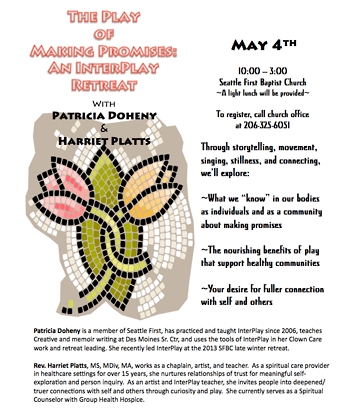 Patricia Doheny is a member of Seattle First Baptist, has practiced and taught InterPlay since 2006, teaches Creative and memoir writing at Des Moines Sr. Ctr, and uses the tools of InterPlay in her Clown Care work and retreat leading. She recently led InterPlay at the 2013 SFBC late winter retreat. Rev. Harriet Platts, MS, MDiv, MA, works as a chaplain, artist, and teacher. As a spiritual care provider in healthcare settings for over 15 years, she nurtures relationships of trust for meaningful self-exploration and person inquiry. As an artist and InterPlay teacher, she invites people into deepened/ truer connections with self and others through curiosity and play. She currently serves as a Spiritual Counselor with Group Health Hospice. Categories: Events and Workshops & Retreats. Tags: events, Interplay, play, and workshops. Play increases flexibility, spontaneity, and wonder! In these classes, you’ll be introduced to user-friendly play forms and body wisdom tools from the system of InterPlay. Both a creative process and philosophy, InterPlay supports people returning to more natural, easeful states in their bodies through movement, storytelling, singing, and just being. This allows for lightness of spirit, better use of energy, and greater sense of wellbeing. Explore in a supportive community what your body can do – stretching, breathing, moving your hand in a dance, 3-sentence stories, fake tap dancing, connecting with others,…and in the process, create REAL possibilities for your body, mind, heart and spirit to work together again! Date/Time Tuesdays, April 7th and 16th, from 7-9 pm. 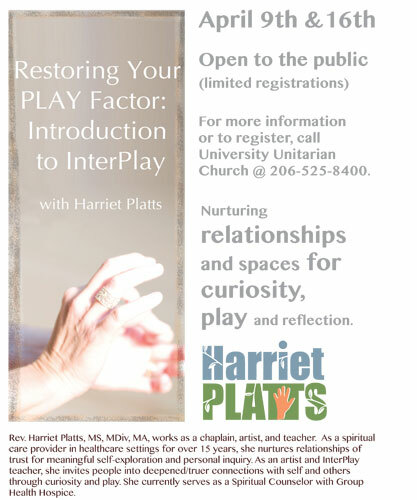 Limited registration to outside participants (6 slots); Contact University Unitarian Church office, M-F, at 206-525-8400. Tags: events, Interplay, and play. A couple of weeks ago, I led a sing-along at the annual staff recognition gathering where I work. Honestly, even though I’ve done this kind of thing before, I always feel nervous, because I want to bring something that’s fresh and engaging, and I wonder if I’ll figure out what needs to come forward. As I anticipated this, I was clear that singing traditional holiday tunes would not cut it given the recent challenging times with my colleagues. What would we sing? As I began preparing, I found myself thumbing through the pages of the Unitarian hymnal, “Living Traditions,” an inclusive collection of songs and readings, and was drawn to the song, “Guide My Feet.” I had an immediate energetic hit in my bodyspirit because I could imagine this group doing this, even more, I could imagine the group up on their feet. After we sang a familiar song to warm-up our voices, I invited the group to stand, and they popped up, surprisingly, with great relief. “Take a step to the right, and then a step back to the left,” I invited them to follow. And there we were, stepping to the right, and then to the left, the sound of unison movement. I invited them to listen to the sound of stepping with their friends and colleagues. The steady rhythm of the simple march, felt soothing in my body. They were smiling, in sway together. Tags: events, music, and workshops.